View More In French Presses. The Espro Press is a precision coffee brewer, similar to a French press, but with a patent-pending two-stage micro-filter that preserves all the freshly brewed flavors and aromas, while keeping sediment out of your cup. The two nested micro-filters work together to block the grinds, and let through only great aromatic coffee. The double lip seal prevents sneaky grinds from sneaking past the micro-filters, and the buffer between the filters prevents over-extraction after brewing. The vacuum insulated double walls maintain stable temperature during the brew, for more precise flavors. After brewing, the coffee stays hot in the press while the outside wall remains cool for hours. Also filters and strains almost any water or alcohol based beverage, hot or cold making this the perfect vessel for loose leaf tea! Making coffee in your Espro press is easy. The process is the same as a typical French press, but the Espro micro-filter does a great job of separating the grinds from the coffee! Preheat the container, add coffee and water, stir, wait 3 to 4 minutes, press and serve. You can adjust the amount of coffee and time to change the strength of your coffee, Filters are BPA, BPS and phthalate free, made from USA manufactured materials in Canada. Vacuum insulated, double walled stainless steel container. Assembled in Canada. If you have any questions about this product by Espro, contact us by completing and submitting the form below. If you are looking for a specif part number, please include it with your message. 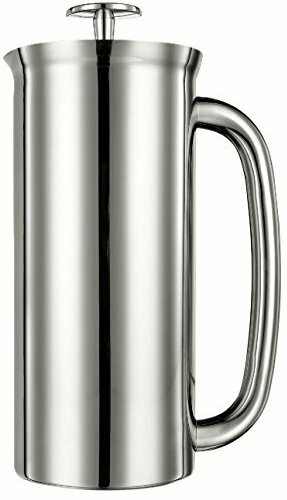 Bodum 1927-16 JESPER 8 Cup French Press, 1 L.